Algerian cartoonist Tahar Djehiche, who was acquitted in May on charges of insulting Algeria’s President Abdelaziz Bouteflika and inciting a riot, has been found guilty on the government’s appeal. He has been sentenced to six months in jail and fined 500,000 dinars. 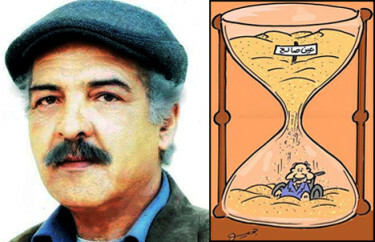 One of Djehiche’s offending cartoons, posted on Facebook, shows the president at the bottom of an hourglass getting buried in the sand. 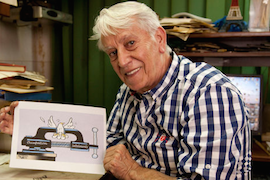 Baha Boukhari, prominent cartoonist for a number of Palestinian journals and for Al-Ayyam newspaper since 1999, has died in Ramallah at the age of 71. In 2008, a Hamas-run court ordered Al-Ayyam banned from the Gaza Strip because of a Boukhari cartoon mocking Hamas parliamentarians. The court had, according to Palestinian Chronicle, found the cartoon “defamatory, disrespectful and bordering on blasphemous.” The court also ordered suspended jail sentences and fines against Boukhari, the newspaper’s editor, Akram Haniyeh, and the paper’s Gaza distributor. The attempted censorship of Boukhari was met with public demonstrations in the cartoonist’s defence. That year, Baha Boukhari was named winner of CRNI’s Courage in Editorial Cartooning award. Malaysian cartoonist Zunar is speaking about his career, his art and his free-speech activism at a number of venues in London and at a Q&A in Zurich prior to his upcoming trial on sedition charges in Putrajaya. 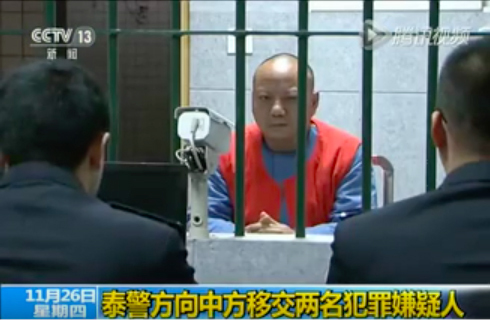 His trial is scheduled to begin on November 6. Zunar’s charges stem from twitter posts he made following the verdict rendered against opposition leader Anwar Ibrahim. 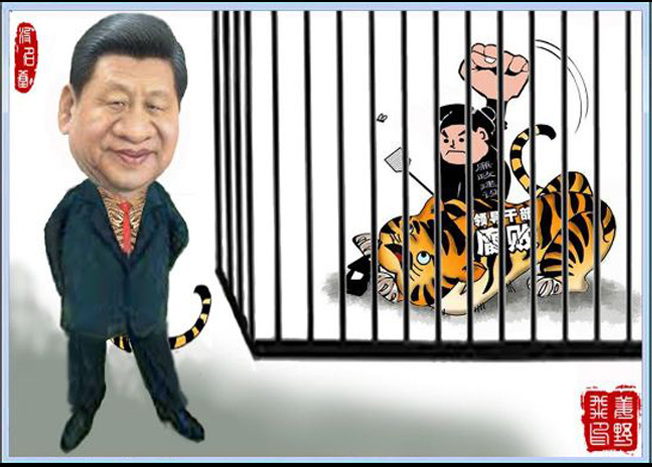 If found guilty, the internationally reknown cartoonist could face 43 years in prison. 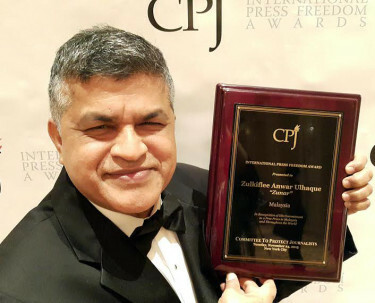 Index on Censorship, Amnesty International and Cartoonists Rights Network have called for the government of Malaysia to guarantee Zunar’s freedom of expression and drop all charges against him. 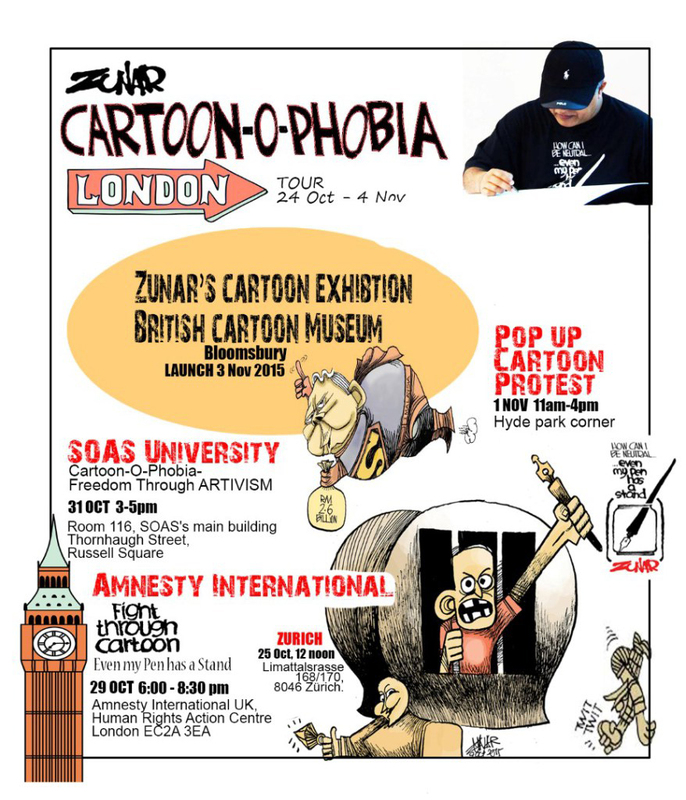 During his “London tour,” Zunar will lead a cartoon protest at Hyde Park’s Speakers’ Corner and speak about the power of cartoons at Amnesty International UK’s Human Rights Action Centre. Zunar will also be on hand for the opening of a Cartoon Museum exhibition in which he is participating.